(Nanowerk News) Iron oxides occur in nature in many forms, often significantly different from each other in terms of structure and physical properties. However, a new variety of iron oxide, recently created and tested by scientists in Cracow, surprised both physicists and engineers, as it revealed features previously unobserved in any other material (Physical Review Letters, "Phonons in Ultrathin Oxide Films: 2D to 3D Transition in FeO on Pt(111)"). The new form of iron oxide (FeO) is a metallic crystal with virtually no defects, a unique conglomerate of electrical and magnetic characteristics, and atoms that vibrate as if the number of dimensions has been reduced. This remarkable material has been prepared, modelled and tested by physicists at the Leading National Research Centre (KNOW) in Cracow, Poland, which includes, among others, the Institute of Nuclear Physics of the Polish Academy of Sciences (IFJ PAN), the Institute of Catalysis and Surface Chemistry of the PAS (IKiFP PAN) and the Faculty of Physics and Applied Computer Science of the University of Science and Technology (WFiIS AGH). A group at IFJ PAN was responsible for computer simulations of material. The team from IKiFP PAN and WFiIS AGH, who initiated the research, carried out experiments determining the formation of new iron oxide layers and its properties. Physicists at the European Synchrotron Radiation Facility (ESRF) in Grenoble, the University of the Sorbonne in Paris, and the Pedagogical University of Cracow also participated in the work. "We've been working with modelling materials, including varieties of iron oxide, for years. Our models, constructed on the basis of the fundamental principles of quantum mechanics and statistical physics, have allowed us to determine the positions of atoms in the crystal lattice and to predict the electric, magnetic and thermodynamic properties of materials," explains Dr. Przemyslaw Piekarz, head of Computational Materials Science at IFJ PAN. The theorists in Cracow specialize in studying lattice dynamics, allowing them to determine how atoms in a crystal of a material vibrate. One of the basic tools they use is the PHONON program, created and developed by Prof. Krzysztof Parlinski (IFJ PAN). The VASP (Vienna Ab-initio Simulation Package) software was used to optimize the model. "Our model contains a layer of oxygen and iron with the thickness of a single atom deposited on a substrate made of platinum. The atoms in the monolayer are arranged in a hexagonal structure, like a honeycomb, a construction similar to the famous hexagonal two-dimensional graphene layers," describes Dr. Piekarz. He stresses that graphene creates a perfectly flat surface, entirely composed of carbon atoms. The modeled iron oxide layer, however turns out to be crimped: each iron atom was here surrounded by three oxygen atoms, located a little further from the substrate than the iron was. Calculations carried out for a single monolayer have established what types of vibrations are performed by atoms in the crystal lattice at different energies. The theoretical predictions were verified against the measurements thanks to a group headed by Prof. Jozef Korecki (IKiFP PAN and AGH). Not only have they developed a procedure for the preparation of samples with multiple monolayers of iron oxide on a platinum substrate, but over the past few years they have also been carrying out a series of measurements of their properties using the ESRF synchrotron in Grenoble. "In our laboratory the key to stabilizing materials of unnatural origin is the deposition of monocrystalline layers on the substrate - in this case it was properly oriented single-crystal platinum - which enforces the structure of the growing medium layer. In the laboratories scientists managed to produce a structure of stoichiometric FeO numbering no more than two monolayers of the oxide. Upon adding successive layers, the whole automatically transformed into magnetite Fe3O4. We were able to choose the parameters of the process so that the structure of FeO remained stable for a thickness of several atomic layers," says Prof. Korecki. Experiments at the synchrotron in Grenoble revealed that measurement data concerning vibrations of atoms in the crystal lattice of the new form of iron oxide perfectly agree with the theoretical model. Analysis of the results for samples with varying numbers of layers did more than just confirm the accuracy of the theoretical description. Iron oxide usually forms crystal lattices in which atoms are arranged at the corners of a cube (this is the structure of wustite, and among other substances, table salt). It was expected that after applying successive layers of FeO such a cubic structure would emerge automatically. But analysis of vibrations of atoms in the crystal lattice of the samples showed that the systems that count up to around a dozen monolayers still retain the hexagonal structure. This means that the researchers from Cracow were able to produce a new variety of iron oxide, different from the existing crystal structures. Subsequent measurements showed that for the monolayers number from six to ten, the iron atoms in the crystal have a long-range magnetic order. This is an unusual feature since a basic version of iron oxide is an antiferromagnet, wherein the magnetic moments of iron atoms at different locations are oriented in opposite directions, and therefore the substance as a whole is not magnetized. Meanwhile, the magnetic properties of a new phase of FeO are visible even at room temperature. "Spintronic materials for construction equipment have been sought after for many years. These instruments make use not only of the electrical current, but also the conduction of electron spin, which is responsible for its magnetic properties," relates Dr. Piekarz. 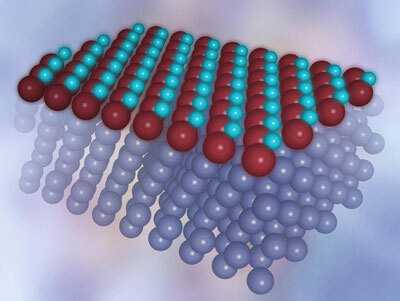 "Our new material is not an insulator, like most oxides, but metal. So this combination of electrical and magnetic properties, rare for oxides, may be interesting for spintronics, as well as in the construction of various types of sensors and detectors." Of particular interest, however, was the analysis of the vibration of atoms depending on the number of layers of FeO on the platinum substrate. For one or two layers the movement of atoms is of a two-dimensional nature. When the number of layers reaches six or more, atoms vibrate as in a typical three-dimensional crystal. In the materials studied to date the nature of the vibration was closely associated with the dimensionality of the system. Meanwhile, a new variant of iron oxide at three, four and five layers of atoms proved to vibrate in an intermediate manner, corresponding to the fractional numbers of dimensions. "We're dealing with the first material in which the nature of vibration of atoms gradually passes from two-dimensional to three-dimensional. A similar effect, although expected in theory, has never before been observed in any other substance," claims Dr. Piekarz.